Leonard Nimoy played the role of the half Vulcan, half human Spock in the Star Trek series on TV from 1966 to 1969. Nimoy felt that the role needed a special greeting to set the Vulcan residents apart, so he dug into his childhood in Boston where he attended a synagogue with his Orthodox immigrant parents from the Soviet Union. He remembered seeing the Kohanim reciting the priestly blessing (Duchaning) at the conclusion of the Musaf service on Shabbat and holidays, and peeking out from behind a tallit to see them part their fingers as they prayed. He was told not to look because he might see the awesome presence of the Shechina that was summoned by the Kohanim. But he looked anyway and it made a deep impression on him. Years later when he was developing the role of Spock, he suggested using that hand motion as the basis of a Vulcan greeting. In an interview for the Wexler Oral History Project at the Yiddish Book Center, the 82-year-old actor offers a personal recollection of his boyhood experience in Boston and the circumstances surrounding the choice of the priestly blessing as the basis for the Vulcan salute, "Live Long and Prosper." 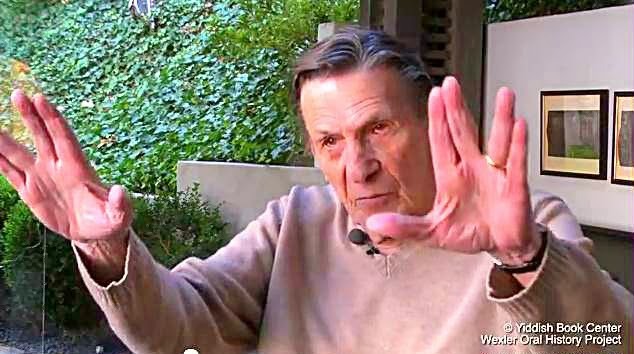 Here's Nimoy's interview followed by a clip of him giving the salute in a Star Trek episode. Outside of Israel, kohanim recite the priestly benediction towards the end of Musaf *only* on holidays, and not on Shabbat which is not also a chag (such as Passover, Shavuot, Rosh Hashana, Yom Kippur, Succot and Shmini Atzeret/Simchat Torah).